The Discovery Triangle Development Corporation is launching a fresh food initiative that will bring a mobile produce market to underserved neighborhoods located in the Discovery Triangle. The “Fresh Express by Discovery Triangle” will sell fresh, affordable and high-quality fruits and vegetables out of a donated, retrofitted Valley Metro bus. A launch event was held on February 25 at the Brunson-Lee Elementary School in Phoenix. Phoenix Mayor Greg Stanton and Tempe Mayor Mark Mitchell jumped off the bus with bags of apples for the kids. The mayors and community partners spoke at the event. The bus, stocked with fresh produce, was available for tours. “The Fresh Express is another example of Phoenix finding innovative ways to address problems and improve the quality of life of residents,” said Phoenix Mayor Greg Stanton. The Discovery Triangle, which facilitates redevelopment in Phoenix and Tempe, developed the initiative after examining the lack of accessible grocery stores in the area, considered a “food desert,” and seeing a need to enhance the health of residents. Providing a mobile option is key since many of the residents in the area depend on public transportation. “As civic entrepreneurs, the Discovery Triangle brings partners together to solve issues impacting the region. We believe increasing the accessibility of affordable, healthy food and health education will boost the region’s economic development opportunities,” said Don Keuth, president of the Discovery Triangle Development Corporation. 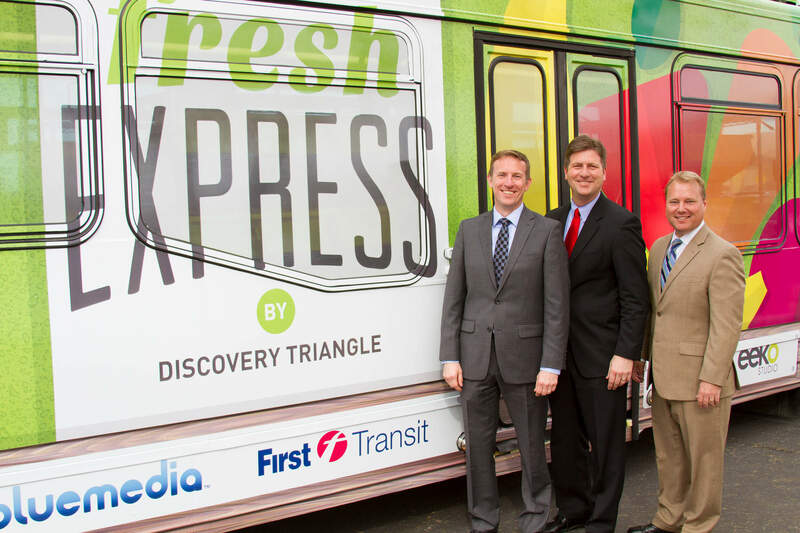 Fresh Express by Discovery Triangle will begin selling produce in March with a pilot program on Tuesdays and Thursdays. Routes will include schools, senior centers, parks, churches and other gathering places throughout the Discovery Triangle region. Chase Bank, the founding sponsor, provided seed and operations funding to help launch Fresh Express. “Many people in the Discovery Triangle are dependent on public transportation to get to a grocery store. Now residents will have more options with the Fresh Express bringing affordable fruits and vegetables to convenient, walkable locations,” said Paul Groves, who heads the JPMorgan Private Bank in Arizona. The bus also will offer on-board community health resources including nutrition education and health screenings. Produce will be sold at affordable prices. All forms of payment will be accepted including SNAP (Supplemental Nutrition Assistance Program).